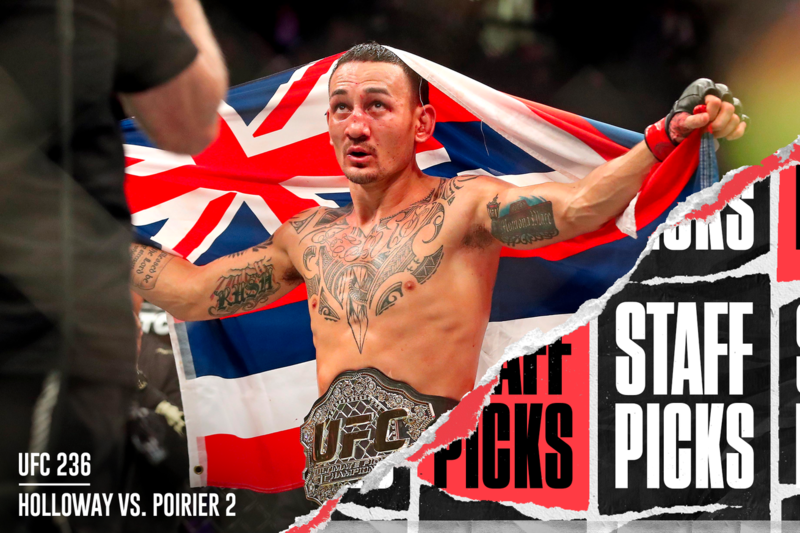 Check out the Bloody Elbow staff’s picks and predictions for Saturday’s UFC 236: Holloway vs. Poirier 2 fight card in Atlanta, Georgia. The Bloody Elbow staff has made its predictions for UFC 236, and even though both interim title fights look very competitive on paper, it’s overwhelmingly one-sided in the picks department. Everyone is going with Max Holloway to defeat Dustin Poirier in the main event (which obviously means Poirier will win), and only Shakiel Mahjouri is going with Kelvin Gastelum for the W over Israel Adesanya in the co-main event. Mookie Alexander: The only thing I hate about this fight is that there can only be a maximum of one winner. I don’t want either of them to lose. Holloway is clearly the better striker, and that’s not a knock on Poirier. Dustin is the heavier hitter, whereas Holloway is more accurate and drowns you with his volume. I do not expect this fight to hit the ground, but if it does then things can get interesting. Poirier is a very underrated grappler, and that’s even if you just passed off the first Holloway fight as Dustin being far too experienced and skilled for a green Max. The other key is durability. Poirier has been stopped a couple of times before but has otherwise shown himself to be very hard to put away. Holloway has arguably never been badly hurt in any of his UFC fights. I can’t recall the last time i saw him as much as wobble. That’s an exceptional skill to have against a power striker like Dustin. What this might come down to is footwork (as Connor Ruebusch notes in his Judo Chop), in which case Holloway uses that so expertly to set up the proper angles to fire off his combination striking while taking minimal damage in the process. I’m expecting this to be an action-packed fight early on, with Poirier getting his licks in and proving to be super competitive against Max, but as the fight progresses Holloway just becomes an unstoppable wrecking machine. Max Holloway by unanimous decision. Zane Simon: This should be an absolutely excellent fight. Poirier and Holloway have both evolved into very clean, technical, high-output strikers, and among the best MMA fighters in the world. Finding the room between them this time may come down to some very particular minutia. In the broader scope, however, Holloway’s takedown defense has improved miles beyond his early fights, and he’s the higher-output, better defensive fighter between the two men. He’s also never been KO’d. So, if Poirier can’t get Max down, and can’t stop him standing, he may find himself just dropping rounds on volume and points. The smaller factors are Poirier’s power striking, his excellent defense and counter-punching as he leaves the pocket, and Holloway’s slow building combination striking behind his jab-cross. Holloway can get clipped up moving backwards early in fights, and caught off guard by wild offense late when opponents get desperate to stem the ever-increasing tide of punches coming their way. Poirier is good at lunging into the pocket with power, but also puts himself at his greatest defensive risk doing so. If he can jump in and go after Holloway early, however, he may have some very good success before Holloway can get his timing down. If he can’t, it could come down to finding that one huge counter shot that could put Holloway away, as Poirier loses the rounds. Max Holloway via TKO round 4. Victor Rodriguez: I’m fully confident in Poirier’s ability to eventually make his way in and deal with Max’s range, but after the first two rounds, Max is going to start throwing enough things at him that it’ll be tough to keep up. Both have really good cardio, but it seems to me that Max’s speed will make a difference here as well. Waianae stand up. Max Holloway by TKO. Mookie Alexander: It feels like there has been way too much over-analyzing of the Silva fight. And that Silva had some success backing Adesanya up didn’t really provide some magical blueprint of “Just make Izzy go backwards and he’s mortal.” Even a faded Silva provides most fighters a lot to think about when it comes to striking. Gastelum is a dangerous, heavy-handed, quick pressure boxer but he’s also quite limited in his attacks. He loves the jab-cross combo and centers his striking around his left hand, and that’s not the type of striking depth I feel it takes to beat someone as advanced as Izzy. Gastelum also has never been a defensive stalwart, so I can see Adesanya using his reach and jab to just pick apart Kelvin as he pleases. The real wild card here is if Gastelum can go to his wrestling and push for takedowns. There are still valid concerns about Adesanya’s bottom game from the Marvin Vettori fight. His TDD was excellent against Brad Tavares and Derek Brunson, but Gastelum is way better than both men. If Gastelum wants to try and somewhat grind this fight out, I think he can actually win this. But I have to go with Adesanya to just outstrike Kelvin and to win this on points. Israel Adesanya by unanimous decision. Zane Simon: Gastelum is a live dog against pretty much every elite welterweight and middleweight in the world. He’s double-tough, has remarkably fast hands with good power, and keeps his cardio well into late rounds. That alone is enough to make him a very difficult fighter to beat. On the flip-side, however, he’s also a very predictable fighter. Sort of like a middleweight John Dodson, Gastelum is all about firing power left hands, every other part of his game is a setup for that. Also, perhaps helping maintain that good cardio, he’s a very relaxed defensive wrestler... to a fault, and rarely shows any interest in offensive wrestling himself. Adesanya can get caught on the back foot, thinking that he’s safer than he is. And he can get clipped coming forward with his confident entries into the pocket. But he’s difficult to surprise, has very good eyes for incoming strikes, and generally great footwork. Assuming he can read Gastelum’s left hand, he should be able to draw Kelvin into coming forward and land counters pivoting out of the pocket. And given Gastelum’s own inconsistent counter game and Adesanya’s huge reach advantage, he should be able to create a lot of one-way point scoring offense off the front foot. Israel Adesanya by decision. Victor Rodriguez: Adesanya is the guy that nobody else in the division can really prepare for properly, and Gastelum might run out of answers quick here. Kelvin’s long arms can be deceptive, but a guy with Israel’s striking pedigree should be able to figure him out and spring back up from takedowns. I’m guessing Adesanya also might try to mix in some hard body shots to wear Kelvin down, while sniping with shots down the middle and keeping things outside and at midrange, but never in the clinch unless he initiates it. Israel Adesanya by TKO. Mookie Alexander: I’ve never seen Eryk Anders jab. I’ve never seen Khalil Rountree display any semblance of good cardio. Rountree is the more dangerous finishing threat. Anders is more likely to win some slog of a bout that features too much staring. This is a toss-up matchup and I don’t really understand the appeal of this particular bout. Khalil Rountree by KO, round 1. Phil Mackenzie: There is a major chance that this is boring. Both men are fairly low pace and rely on their power, and both are coming off losses. There’s always the chance in this kind of fight that both guys see someone that they can be by being “more technical” and so we get something of a staring match. Anders has shown more durability, a better gas tank and a little more of a knack for wrestling, but there really isn’t much in it. Eryk Anders by unanimous decision. Zane Simon: Rountree is the more fluid, natural and coordinated puncher. But he’s also shown less of a gas tank and less durability. Anders may not have much beyond his lead left, but he sticks to it and carries his power decently as the fight goes on. Rountree tends to have a round in him before things go way off the rails. Eryk Anders via KO, Round 2. Victor Rodriguez: Can’t trust either guy, sadly. Seems to me that Rountree might blast Anders with something massive early and put the lights out. If not, we’re in for a long slog with sweaty hugging. Whatever. Khalil Rountree by TKO. Mookie Alexander: Jouban should win this, as he’s more consistent minute-to-minute than Grant. It’s evident that Grant is an all-or-nothing fighter, hence the boring-as-hell Zak Ottow fight followed by the complete annihilation of Carlo Pedersoli. Jouban is up there in age and his durability concerns me, so I’m going to gamble and take Dwight Grant by KO, round 2. Phil Mackenzie: Jouban has a more functional round-winning style. Body kicks and punches, decent footwork. Grant has a terrible tendency to take his foot off the gas and look for one big punch. The problem is that there’s a good chance he’s going to find it. Jouban doesn’t have tremendous defense in the pocket, and fighters who have been athletic and quick enough to close distance on him have been able to hit him hard. Dwight Grant by TKO, round 1. Zane Simon: If Jouban doesn’t get KO’d, then he probably wins a pretty clear decision. Grant tends to only fight in short offensive bursts. And while he may be a decent wrestler, he doesn’t really show it on offense. Jouban is much more persistent in his striking and creation of exchanges, more creative in his output, and can be a dangerous grappler when he gets the chance. He’s also much more likely to get melted by one huge shot or flurry of them. Dwight Grant via KO, round 2. Victor Rodriguez: Grant is on the come up, and I’m a believer. He fights smart, conserves his energy and doesn’t throw strikes away doing anything wasteful. He should be able to land some hard shots and get ahead on the scorecards, because Jouban’s got a hell of a chin. Grant might put him out, but I’m picking Grant by decision, because hunches. Mookie Alexander: It’s light heavyweight, it’s these two fighters, it can only end one way. OSP by rear-naked choke with no hooks in, round 1. Phil Mackenzie: The rematch we’ve been craving. Krylov’s striking has legitimately improved, to the extent that he can now throw tons of weird strikes without gassing. There’s a solid chance he can just overwhelm OSP, who is starting to look like he’s getting old. That being said, OSP is a decent counter puncher, but more to the point is a good wrestler for the division. Krylov’s grappling is still just kind of terrible. Ovince Saint-Preux by submission, round 2. Zane Simon: I do think that Krylov has improved since his first UFC run, but mostly that’s in becoming a more calm and collected striker who doesn’t burn through all his energy in a couple minutes. On the ground, his grappling is still a mess of high aggression sub hunting and limited sub defense. It’s also notable that even against poor opposition, he’s often turned to his wrestling and grappling as a primary avenue of offense. If Krylov is going to try and take OSP down, or if he’s going to defend takedowns by tossing up poorly planned guillotines, then I’ve got to take OSP by submission, round 1. Victor Rodriguez: Another battle between two guys where I’m conflicted because I don’t know who to trust less. OSP hits harder and pounces on finishing opportunities faster than Krylov does, and can be an overpowering athlete. Krylov’s gonna have to land something very surprising to get ahead here. OSP by TKO. Phil Mackenzie: Frevola has a surprisingly decent power punching style: he mixes up his targets, sits on his shots, and throws in combination. However, all this means that he needs to be planted to do so, and thus he has something of an issue with allowing his opponents to dictate range. Turner is an absolute behemoth of a lightweight who likes to probe from range to land power shots, and Frevola is immobile enough to let him. Should Frevola survive what is likely going to be a brutal early going for him, he may be able to turn this into a brawl, but Jalin Turner by TKO, round 1. Zane Simon: I really liked the technical improvements Frevola showed in his combination striking against Vannata. He looked like a much cleaner kickboxer than ever before. However, he still almost got melted out of the gate, due to his lax defense, and still doesn’t show much in the way of range striking skills outside a really nice body kick. He did show some counterpunching, which we know Turner isn’t immune to, but I don’t think it’s nearly as clean or accurate or prepared to deal with a huge range disparity as Vicente Luque was. Turner has the frame and style to dictate range with long power shots, and I’m not sure that Frevola can negate that by jumping into the pocket. However, if Frevola can make this fight a mess for more than a round, Turner’s ability to handle adversity is a serious question. Jalin Turner via TKO, round 1. Victor Rodriguez: Oof. Turner’s wrestling is gonna get tested hard here. It’s a test he can pass, but if he doesn’t, it’s gonna be another slog. Jalin Turner by TKO. Phil Mackenzie: The question here is “how much did that Reis-Ortiz fight indicate what’s going to happen in this one?” Pantoja’s defensive wrestling is not bulletproof, and Reis himself handily outwrestled and outstruck Ortiz. However, Reis has been visibly slowing and a key ingredient in Ortiz’ own win over Pantoja was a pace which I just don’t think he can keep any more. Alexandre Pantoja by unanimous decision. Zane Simon: My gut is absolutely telling me to take Pantoja here. Likely just for pace and striking power. However, this matchup is brutally bad for Pantoja and almost exactly the kind of fights he tends to lose and Reis tends to win. Pantoja’s tendency to sit on hard combos in the pocket almost always leads him to three paths: he shoots behind the combo, he clinches behind the combo, or his opponent shoots in on him behind the combo. In all three of those situations, Pantoja would be regularly tying up with Reis and taking his faster range striking out of the equation. In his fight against Ortiz, Pantoja even had early success grappling, but doing so gassed him badly. And Reis is a more controlled, more technical grappler than Ortiz. It’s a chance pick, but Wilson Reis by submission, round 2. Victor Rodriguez: Wilson Reis is a straight gangster, despite not being an elite striker here. His wrestling is overlooked even though his submission pedigree is unquestioned. Panjoja’s more of a generalist with good mixups and a safe defensive game. Reis should be able to control the fight more and end up notching a decision win here. Wilson Reis by decision. Phil Mackenzie: Another big, somewhat slow-paced power puncher makes his UFC debut. Griffin had a close (possibly unjust) loss to Thiago Alves last time out, but Alves is a tremendously crafty striker, and Griffin has shown against monotone hitters (eg Perry, M.) he can stick and move with the jab. Max Griffin by TKO, round 2. Zane Simon: Imadaev has some raw athletic tools and the kind of aggression you want to see out of a good prospect. But, his record is not impressive and the actual footage of his wins shows a fighter who is getting away with a lot of technical flaws against very overmatched competition. Griffin has been a win-loss action fighter with the UFC, but those losses have largely come against fighters who had big technical edges against him either as strikers or as wrestlers. Without that, Griffin’s insane toughness and decent natural power should make for a close firefight early that eventually leaves Imadaev wading into deep waters he isn’t prepared for. Max Griffin via TKO, round 3. Phil Mackenzie: This should be great. Taha is quick and fairly well-rounded, keeping a good pace and peppering opponents with stance switches, punch combinations and kicks. However, as showed in his last fight against Narimani (admittedly up a weight class) he can be physically overwhelmed. Boston Salmon is slower on his feet, but looks like an tremendous hitter. There are a lot of DWTNCS alums who get flashy KOs, but Salmon has lovely weight transfer and hits with authority. If Taha can drag Salmon into deep waters, he has a good chance, but he’s going to be in constant danger of getting smoked. Boston Salmon by unanimous decision. Zane Simon: I have serious concerns about Salmon’s long layoff. Health issues seem to have plagued him lately. He also notably doesn’t push a strong pace as a striker, preferring occasional lead combos and single power counter-shots. If Taha can just get in his face, be aggressive and make him wrestle and grapple a lot, he could take advantage of ring rust and Salmon’s poor pace to get a good win. However, Salmon is a much cleaner technical striker and Taha really lacks the solid footwork and range striking tools to make transitions from distance to the pocket easy. Having to jump in and square up against a powerful counter striker, is just begging to get clubbed. Boston Salmon via decision. Victor Rodriguez: I refuse to pick against Taha. I don’t know why. Roll the dice. Khalid Taha by something. Phil Mackenzie: Millender’s grappling was exposed badly last time out, so there’s a real chance that Belal Remember The Name Muhammad can do the same: he’s a very underrated clinch wrestler and top position player, and in the orthodox matchup he can kick the lead leg and come in behind the right hand to attack the clinch. However, the physical disparity here is absolutely enormous, not least in the size. Belal Remember The Name Muhammad is smaller than a lot of lightweights, and will be dwarfed by the bigger and far more powerful Millender. Given that a lot of a wrestling gameplan requires him going strength-for-strength, it’s a pick I’m very saddened to make. Curtis Millender by unanimous decision. Zane Simon: I really want to ride with Millender on this and follow Mackenzie’s pick. But, I just can’t. Muhammad tends to come in with a good, steady gameplan for his opponents, and it’s hard to overlook the massive flaw in Millender’s game that he can exploit. He’s also one of the higher-output, more durable fighters at 170 lbs. Maybe Millender can do what Neal did, just stick him outside and beat him to the punch all night, but I don’t think Millender has that kind of speed or is that natural a counter-fighter. Belal Muhammad by decision. Phil Mackenzie: Jackson looks like a phenomenal prospect. Huge, powerful, and visibly improving from fight to fight. Thus far in the UFC he’s largely been tested against pure aggression (Kelleher and Simon). Soukhamthath is almost the opposite end of the spectrum: a powerful kickboxer who sometimes lets the perfect be the enemy of the good in looking for a big shot. There isn’t a significant technical reason to pick Jackson here, other than the fact that he just seems like someone who “gets” how to fight and Soukhamthath often just doesn’t. Montel Jackson by TKO, round 2. Zane Simon: Soukhamthath has one of the odder striking games at 135 lbs. A slow-paced counterpuncher early, he tends to turn into an exchange leading higher-volume striker as bouts go on. He also tends to get really tired following that strategy. It leaves Soukhamthath with a 2nd round sweet spot. Where his timing is there and his cardio isn’t gone yet. In that spot, he’s very dangerous. But, against a lightweight sized bantamweight with a solid range sniping style and absurd grip strength to fend off Soukhamthath’s backup wrestling game? It just seems like he’s going to give Jackson a lot of early momentum and by the time he’s ready to steal it back, the opportunity probably won’t be there. Montel Jackson via decision. Phil Mackenzie: I’ve been making a lot of “athleticism” picks this week, so I’ll mix it up a bit. Botelho is a nasty kicker, but she really hasn’t shown much in the way of ancillary skills. Mueller is a bit clunky, but she at least pressures behind strikes with some measure of defense. Lauren Mueller by unanimous decision. Zane Simon: Every time I’ve seen Mueller fight since her DWTNC win, she’s looked like a less bullish, less offensively potent version of herself. It seems like she may be caught up learning the fundamentals of kickboxing, and it’s distracting her from getting to the pressure clinch game that she did so well with early on. Botelho’s range kickboxing, to back foot brawling, to guard grappling game isn’t designed for consistent success, but she knows it and she sticks to it and she’s dangerous doing it. Mueller doesn’t seem to have that same confidence or potency right now. Poliana Botelho by submission, round 2. Victor Rodriguez: Zane’s right about a lot of what he said, but it’s Mueller’s second-guessing and hesitation that concerns me here. Poliana Botelho by decision. Phil Mackenzie: Am I missing something? Costa is 4-0 against opposition with a combined record of 5-15, with all of the wins (and most of the losses) coming from 5 and 9 Chris “Maluco” Thorne. Davis is huge and tough and endlessly aggressive, and with that level of competition Costa would need to have a world-class background (Olympic wrestling, ADCC winner, X-Arm, Ultimate Ball etc) for me to ignore the sheer experience disparity. Add to this that he seems to be a bit of an aimless volume kicker and... well. Maybe Davis just gets dunked by a random head kick and I look like a wally for this pick. Brandon Davis by unanimous decision. Zane Simon: There’s really not much to Costa’s game that says he’s ready for this kind of step forward. He may be a good athlete? (He’s certainly better than the 0-0 guys he’s been running through, but so is every UFC fighter) His high-octane high kicking style may be unique and dangerous? (It’s notable that he’s mostly finishing people with swarms of punches or GnP). But at 4-0 against the lowest end of competition it’s impossible to tell anything really. Davis is an absurdly high output pocket striker who is actually a pretty slick technician when he gets in rhythm against an opponent willing to stay in front of him. Costa might mix things up enough to stay outside and pot shot, or might have the power to just hit slamming takedown after slamming takedown. Or he might try to stand inside and throw nothing but high kicks while Davis tees off on him. I’ll pick that last one. Brandon Davis by TKO, round 2.